If you’re primed to explore the wonders of the New Orleans Arts District (Warehouse District), you should know that you’re making a great decision. This area is world-renowned as a vibrant hub for culture. It’s right in the heart of downtown NOLA, so finding it definitely won’t be hard, and there are so many brilliant attractions in this district, on Julia St. and beyond! Today, we’d like to share information about a handful of exciting attractions which fall into the “not to be missed” category! This region is all about celebrating art. This is why a visit to the local Contemporary Arts Center is strongly recommended. It’s located at 900 Camp Street. Just a hop, step and jump away, at 925 Camp Street, you’ll find the Ogden Museum of Southern Art. Most galleries in the district are clustered on Camp and Julia Streets, so be sure and cruise both streets. You’ll find so many wonderful examples of local art. The most highly-rated galleries in the area (based on Yelp reviews) are Arthur Roger Gallery (432 Julia Street), the eclectic Lemieux Galleries (332 Julia Street) and the elegant and refined Martine Chaisson Gallery at 727 Camp Street. One very special thing to do while you’re in the Warehouse District (Arts District) is to stroll through the poignant and educational National World War II Museum. Over two million visitors have been there. It’s an unforgettable place which features so many fascinating exhibits. It brings this pivotal time in world history into sharp focus. Also, if you’re planning to be in the Big Easy on a Saturday, you’ll be pleased to know that there is an “Art Walk” in the Arts District on the first Saturday of every month. The Art Walk runs from six to nine p.m. and local galleries open their doors in order to give passersby better views of what’s inside! Another fun fact is that you won’t need to pay sales tax when you purchase works of art which are original within the Arts District. Back in the 1900s, this area of the Big Easy was called the Industrial District. Plenty of commodities, including coffee and grain, were transported into the area after arriving at the Port of New Orleans. Changes to industrial practices eventually turned this part of NOLA into a veritable ghost town. Things turned around in 1976, when the Contemporary Arts Center (it’s still open today, at 900 Camp Street) opened for business. Soon, artists flocked to the region and used its airy warehouses as showcases for their creative masterpieces. New Orleans was the home of many prominent and celebrated artists, including naturist, John James Audobon, whose sketches of birds are as dazzling today as they were during his lifetime, and E.J. Bellocq (1873-1949), who took meaningful and edgy photographs of NOLA’s “ladies of the night”. Today, plenty of talented artists choose to work and play in the Arts District. They love its vibrancy and the way that the New Orleans community supports culture. 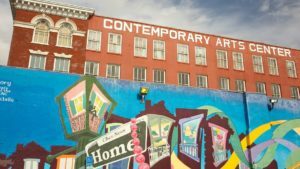 Now that you know more about the New Orleans Arts District, why not spend as much time as you can there? It’s well worth a visit and you’ll leave with fond memories of the area.